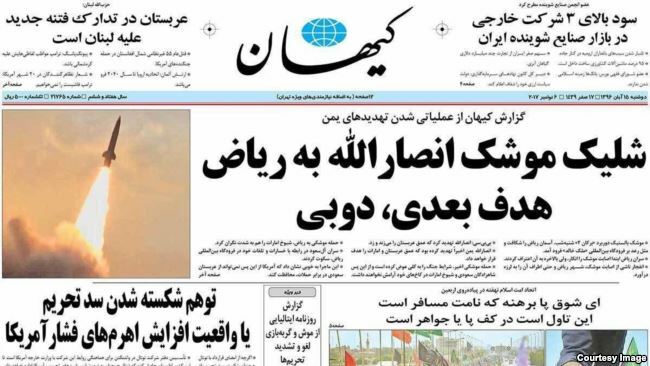 Iran’s most conservative newspaper won’t be published today. The government issued Kayhan with a two-day ban after it ran a front-page story saying that Dubai was the “next target” for Yemen’s Houthi rebels. Officials deemed the story contravened Iran’s national security amid regional tensions. Last Saturday, the Houthi targeted Riyadh with a ballistic missile, which was intercepted close to the Saudi capital. Saudi officials accuse Iran of supplying the missile; the state-media mouthpiece declared the attack “an act of war”. While the censored newspaper is edited by a man linked to the Supreme Leader and with ties to Iran’s intelligence services, a missile attack on Dubai is unlikely. The glittering Emirati city is a key trading hub for Iranians and some 10% of the city’s population is Persian. Also home to a large international presence, an attack on Dubai would prompt widespread condemnation. More likely is an escalation in Yemen and, perhaps, by Israeli forces against Hezbollah in Lebanon. There, PM Saad Hariri resigned last week under Saudi pressure. The move is believed to be aimed at galvanising opposition to Iranian-proxy Hezbollah. Given Lebanon’s bloody history of civil conflict, deep sectarian divides and proximity to war-ravaged Syria, a confrontation here could be disastrous.